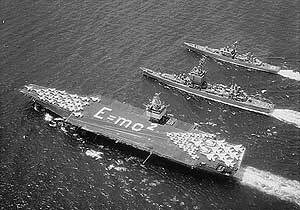 The USS Long Beach was the first nuclear powered surface warship in the world and the first large combatant in the US Navy with its main battery consisting of guided missiles. Launced in 1961, the Long Beach was decomissioned in 1995. The hull is currently stored and waits disposal in Bremerton, Washington. In addition to being the first nuclear powered surface warship, Long Beach was also the first American cruiser since the end of World War II to built entirely new from the keel up and boasted the highest bridge in the world when built. The Long Beach was the last warship to be fitted with teakwood decks. Originally ordered as CLGN-160 and reclassified as CGN-160 in early 1957 and again as CGN-9 later the same year.